Herbal/Holistic medicine and extracts for parrots. 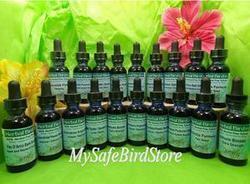 Welcome to the holistic world of nature captured in this exclusive line of Herbal Bird Rx herbal extracts. These products provide safe, bird specific, and alcohol free herbal extract alternatives to allow you to optimize your bird’s health. And because they’re so palatable they can be served directly into the mouth, mixed into food or added to drinking water. Completely alcohol-free, our proprietary process meets or exceeds the herbal potency of alcohol-based herbal extraction processes when tested by independent laboratories. Therefore, every drop of healing herbal essence is extracted for your bird’s health and well being while at the same time is safe and 100% alcohol free. Cleans environmental and chemical toxins and protects the liver. Environmental toxins are a particular concern as birds’ sensitive respiratory tracts are especially vulnerable to pesticides, fertilizers, smoke, unclean water that can affect their general health and immune systems. This formula works to purify the blood, protect and support organ function and protects the body from further damage while helping liver function for efficient removal of systemic waste and absorbed toxins. Immune booster stimulates resistance to many acute illnesses and general immune responses. It helps stimulate white blood cells, T-cells and killer cells and increases and strengthens the body’s powers of resistance. It can also be given when exposure to other birds is expected such as shows, boarding and visits to the vet. Not to be used long term.